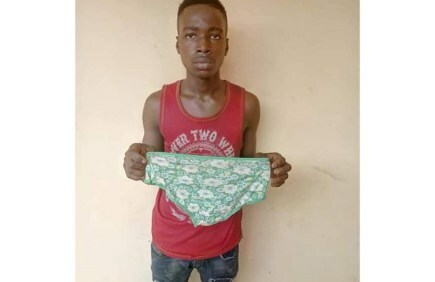 A 19-year-old man has been arrested for allegedly stealing a pair of female underwear in Odoakpu, Onitsha in Anambra State. The suspect, Chinonye Okorie of Mbaitolu, Imo State, was apprehended with the pant by the police in the area. Parading the suspect on Thursday at the police headquarters in Amawbia, the state Police Public Relations Officer (PPRO), Haruna Mohammed, said the suspect stole the pant for alleged ritual purpose. “At about 6:48a.m., police detectives attached to Central Police Station (CPS) Onitsha arrested one Chinonye Okorie ‘m’ aged 19 of Ogbaku in Mbaitolu LGA of Imo State.